If you want to impress your woman this Valentine’s Day, you may want to make sure she doesn’t read this story. 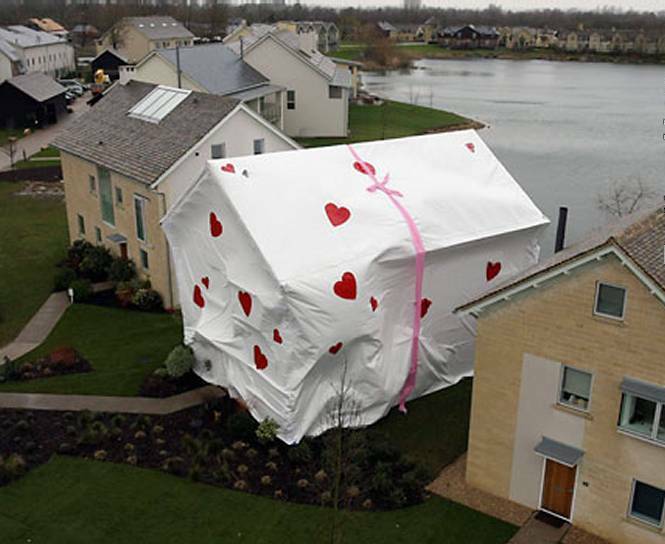 A Los Angeles-based film photographer has bought his girlfriend a new house — and not just a house, a gift-wrapped house. The man, Jasin Boland, used 1,524 m2 of wrapping paper and a 23 m long pink ribbon to cover the million dollar house for his fiancée, Maria Moral Pena. Then he flew Maria in by helicopter to see the four-bedroom waterfront home. “At first, in the helicopter, I didn’t realise what was going on. When I saw the wrapped house, I thought it was a construction area”, she said. “Then when I saw the hearts, I was completely overwhelmed. He’s just so cute”. Boland set up the surprise by telling his fiancée they were going house hunting. “Last year I just took her out to dinner, which wasn’t much of a present. I thought I’d better do something special to make up for it”, Boland said. It’s reported it took five workers using two cherry-pickers three hours to wrap the house in monoperm, a synthetic fibre. As if we need to add, the couple plan to get married soon. This entry was posted on Thursday, February 15th, 2007 at 5:58 pm	and is filed under Funny Junk, Interesting Stuff, Wonderful Things. You can leave a response, or trackback from your own site.